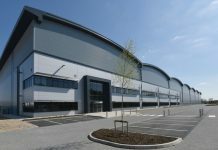 Developers have submitted a planning application to deliver a £140 million business park – with more than 1.75 million sq ft of accommodation – in the North East, which could create thousands of new jobs. Joint venture company Forrest Park Newton Aycliffe Limited, supported by leading West Midlands-based commercial property developers Richardson Barberry, has applied to Durham County Council for outline planning consent for the expansion of Aycliffe Business Park on the 116-acre Forrest Park site located on Junction 59 of the A1(M). The proposals include a range of business, industrial / distributionunits varying in size from 30,000 sq ft to 500,000 sq ft, a trade park consisting of 11 units from 5,000 sq ft to 10,000 sq ft, and ancillary amenity uses including roadside food offerings, a public house and a restaurant. There is also the potential to accommodate a rail freight interchange. Forrest Park – which has attracted £13 million funding from the Local Enterprise Partnership – could create 3,200 jobs and deliver a gross value added economic boost to the area of £495 million over the next 10 to 15 years. A planning decision is expected in April.